Total hip replacement is surgery to replace the worn parts of your hip joint. You may be thinking about having this surgery if you have severe hip pain that limits your movement. Many people get arthritis that can cause the hip joints to wear down over time. In this surgery, your doctor uses metal, ceramic, or plastic parts to replace the ball at the upper end of the thigh bone (femur) and resurface the hip socket in the pelvic bone. You can talk with your doctor to decide if this surgery is right for you. You may want to consider your age, overall health, activity level, and how much pain you have. Why would you have hip replacement? You have very bad hip pain. Medicine and other treatments do not ease the pain. You cannot move well enough to do your daily activities. You want to keep golfing, biking, hiking, and doing other exercise. You are at a healthy weight or will be able to lose weight and keep it off. Being too heavy puts strain on the hip joint. This could make a new hip wear out more quickly than it would if you were at a healthy weight. Why would you not have hip replacement? You are able to control your pain with medicine and other actions. These may include weight loss, changing your activities, and using a cane or crutches. You also could have shots of medicine to reduce pain in your hip. You are still able to move well enough to work, shop, walk, and do other things. You worry about doing physiotherapy, or rehab, after the surgery. This can take several weeks. It also requires changes in how you sit, walk, and do other actions. You have a medical problem that could mean you would not do well with anesthesia and surgery. You may need another hip in 10 to 20 years. This is common with hip replacement. You want to learn more about hip replacement. You want to have a hip replacement. 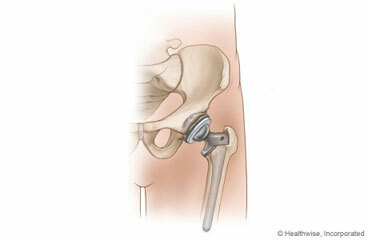 Enter P339 in the search box to learn more about "Deciding About Total Hip Replacement".